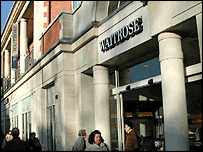 Waitrose is buying 19 stores from Wm Morrison - the UK's fourth biggest supermarket owner, the retailer said. The move marks Waitrose's first foray into the north of England - with the firm buying up stores across Yorkshire, and in Merseyside and Cheshire. The buy - which boosts the chain's selling space by 20% - is the biggest undertaken by Waitrose's owner, the John Lewis Partnership. The sale follows Wm Morrison's £3bn takeover of Safeway earlier this month. As part of the deal, Wm Morrison agreed to sell off 52 Safeway stores to satisfy competition concerns. Of the stores snapped up by Waitrose, 18 are Safeway sites and one is a Morrisons store. Wm Morrison said the value of the net assets of the 19 stores was £158m. The Bradford-based grocer refused to say how much the deal was worth, but it did say the price was in line with its expectations. A spokeswoman for Wm Morrison said the move to becoming a national supermarket chain was "very exciting". And Waitrose managing director Steven Esom added: "This acquisition represents a major step change in our expansion programme. "We look forward to the challenge of competing in different parts of the country." The deal will also see Waitrose strengthen its position in its existing regional markets - it already has 144 stores in southern England, Anglia, the Midlands and Wales. Currently, the group has a 3.5% share of the national food retail market. In the south of England, where it has its strongest presence, its market share is 7%.